Lake Tahoe has some of the finest and most challenging disc golf in the world. It also happens to be some of the most beautiful. It tends to be a little different from other areas. When you're playing at Kirkwood, a roller gone astray can go for a while. for me, when I go to sea level to play I can notice the difference in the way the discs fly (or don't, rather). I can only assume it is equally befuddling to those coming here from sea level. That said, if you're coming here for a tourney, it's best to get some practice days in first. There are four real courses in Lake Tahoe, and several others of the paint rings on trees type. There are no concrete tees within the basin due to strict regulations. In Lake Tahoe, a great place to buy discs is at the South Lake Tahoe Rec Center, as well as Tahoe Sports LTD. Here we'll talk about the official courses. 1. Bijou Disc Golf - PDGA page - Tahoe' s original- this course is a classic. It has very little slope to it for a Tahoe course, but it makes up for that with trees and, well, more trees. In it's normal positions, it would be a relatively easy course for tournament veterans, but fortunately, there are multiple placements for all 27 pins. Directions-Bijou Park is located at the corner of Johnson Blvd. and Al Tahoe Blvd. in South Lake Tahoe. The entrance is off of Al Tahoe Boulevard, that's really all you need to know. Click here for for more Bijou Park info. 2. 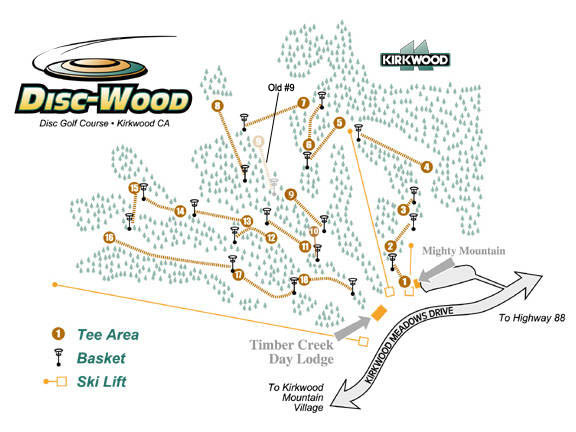 Kirkwood Mountain Resort - PDGA page - This is one beautiful disc course, and a great hike too. The course is challenging, as evidenced by the fourteen hundred foot 16th hole. The season is rather short, from June (sometimes late June) to October (sometimes early). It makes up for that by treating to you to acres of wildflowers. Of course, except for the first hole, you want to avoid the wildflowers. They're usually a sign of a shot gone astray. Kirkwood has eighteen holes, all but three of which feature a significant elevation change. The remaining three just happen to end up at the same level, it doesn't mean they're flat. Directions - Take Hwy 50 to Meyers. After the Agriculture Checkpoint turn left onto Hwy 89. When 89 ends (Pickett's Junction), turn right onto Hwy 88. Follow Hwy 88 fourteen miles to Kirkwood. The disc golf course is at the top of the Mighty Mountain parking lot. Note: In order to preserve Kirkwood's pristine environment the ninth hole has been removed and a new hole has been added after the old tenth. Click here for updated map. Click here for more Kirkwood info. 2008 Update- The plan for this year is to move back to the original course, which is great news. 3. Zephyr Cove - PDGA Page - Zephyr Cove is another course with a lot of elevation change, though not as much as Kirkwood. It features gorgeous views of Lake Tahoe from a number of holes. It is also hot. Even so, wear shorts at your own risk. The manzanita is tough and thick. I have friends with scars from three seasons ago. Zephyr Cove gets around the no concrete tee boxes rule by using anchored thick black mats, which works rather well. In general, most advanced players will find it to be an easy, short course, but loads of fun. Directions - Zephyr Cove Park is located just off Hwy 50 on Warrior Way. Coming from Lake Tahoe, turn at the fire station just past Zephyr Cove Resort. The park is managed by the Douglas County Parks and Recreation Department (775) 586-7271. 4. Truckee Regional Park - PDGA page - Located along the banks of the Truckee River, you would think this would be one of the more scenic courses around. At times, it is. But just when a beautiful view is expanding, you come across acres of broken glass. The river resembles more of an industrial area than anything else. The improvements on the course are excellent, from concrete tees, to blooming Daffodils in spring. Spring is the best time to play this course, as it gets very hot and dusty in the summer. Additionally, the river flows better in the spring. While the course is mapped pretty well, it is sometimes difficult to find the gray metallic baskets. Directions - Coming from Highway 267 (The Brockway Summit)- after the Truckee Airport turnoff you will turn left at the next light (Brockway Road?). The park will be across the street from the 7-11. From I-80, exit on Brockway Summit (267 South) and turn right at the light for Brockway Road. 5. Lake of the Sky Disc Golf - PDGA page - graces the hillsides of North Tahoe Regional Park in Tahoe Vista. There are eighteen full holes with full baskets and tee pads. The course is not overly long, but it is quite challenging. There is a $3 parking fee for non-residents of the NTPUD. The course is already home of a new sanctioned event, the Lake of the Sky Disc Golf Tournament. 6. NEW!! Turtle Rock County Park on Highway 89 just east of Markleeville - Eighteen holes with baskets, quality rubber mats, well marked trails and multiple pin placements. My first experience with this course was that it was Long. We were there on a very windy November day, however, and I'm sure it won't seem so long on future visits (it didn't). However, there are several 750'+ holes when the pins are in their long positions. The terrain is not overly steep, but it is rocky. There is a fee campground on site. Directions - follow Highway 89 from Lake Tahoe south over Luther Pass. When you reach the T (Picketts Junction) take a left. Turn right at Woodfords (stay on 89). You will see a sign for Airport Road and Indian Creek resevoir. Just after Airport Road, Turtle Rock Park is on your right. Get more information about Disc Golf here.